At Mingo Town, Washington found "60 odd Warriors of the Six Nations going to the Cherokee Country to proceed to War against the Cuttawba's." While encamped there, Washington also received news that two traders had been killed by Indians about 28 miles downriver -- at what today is Powhatton, Ohio. On the 23rd, several more accounts of the killings reached Mingo Town, but these accounts suggested that only one white man was killed, and that it was not at the hands of the Indians. Thus, about 2 o'clock in the afternoon, Washington and his companions -- including two Indian guides -- set off down river, making there camp for the night on the Virginia side of the Ohio River at Fishing Creek. His diary continues: "Two or three Miles below the Pipe Creek is a pretty large Creek on the West side calld by Nicholson Fox Grape Vine -- by others Captema Creek on which, 8 Miles up it, is the Town calld the Grape Vine Town; & at the Mouth of it, is the place where it was said the Traders livd, & the one was killd. To this place [Powhatton Point] we came abt. 3 Oclock in the Afternoon, & findg. no body there, we agreed to Camp; that Nicholson and one of the Indians might go up to the Town, & enquire into the truth of the report concerning the Murder." Elsewhere in his Diary, Washington describes the weather for 22-25 October 1770 as blustery and cold. In 1796, George Washington advertised his land along Pipe Creek (in Belmont County, Ohio) for sale, and describes the land as: "Round Bottom ... about 15 miles below Wheeling, a little above Captenon, and opposite to Pipe-Creek; bounded by the river in a circular form for 2 miles and 120 poles containing 587 acres." For Washington's entire account of his 1770 travels in the Ohio River Valley, Please see George Washington's Papers at the Library of Congress, 1741-1799. See specifically: The Diaries of George Washington. Vol. 2. Donald Jackson, ed. ; Dorothy Twohig, assoc. ed. The Papers of George Washington. Charlottesville: University Press of Virginia, 1976. Pages 295-298 of this resource record Washington's account of and contain related notes on the events for 22-25 October 1770. 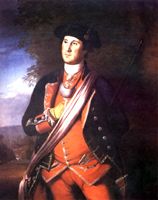 Caption: George Washignton as a Virginia Colonel. Painted by C.W. Peale in 1772.